I love using index cards to plan revisions. The best thing about this technique is that it provides a tactile break from the writing desk that can be justifiably stretched out for weeks. The second best thing is that it really is a useful way to view the entire structure of a novel at once. If you've accomplished the impressive feat of completing a novel, it's intimidating to consider changing anything more dramatic than a few sentences here and there. But revision requires asking tough questions about what could be better on a large scale, so it's useful to start by stepping back from the text. 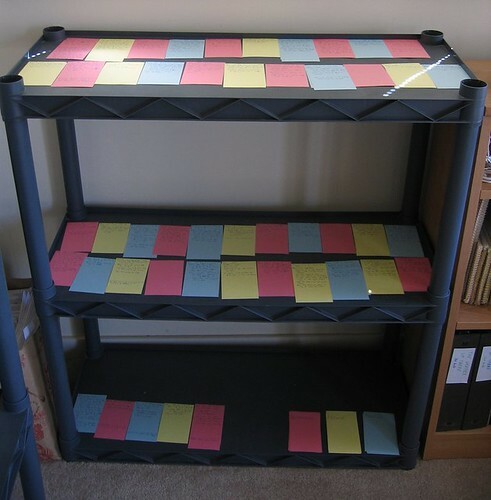 With index cards, you can represent the sections of your manuscript as convenient, colorful rectangles, then rearrange, remove, and add pieces on a provisional basis until you settle on a plan for the changes you want to make in writing. → Create a card for each event in the novel. I've done cards for each scene, but that can wind up being unwieldy if many sets of scenes group together to form an event. Decide on a sectioning scheme to start with, and you can always add more cards if needed. → Label each card with a descriptive title, keeping in mind that it doesn't have to make sense to anyone else, and maybe a few notes. Avoid writing a ton of details. The first time I used index cards, I filled each card with a summary of the scene, and that didn't accomplish much. Everything is in the manuscript if you need to reference it. → Colors are great. Think about what recurring features of your novel can be differentiated, such as subplots, locations, or sets of characters. Get a rainbow of index cards, and maybe also colored pens or stickers to encode additional information on each card. While there's a danger you'll sink way too much time into color coding, the advantage of working with colors is that it lets you see patterns in the novel. You might notice that a particular type of scene occurs too often or not enough, or that the appearances of a certain character should be better spread out. → Find a space to lay out your cards, ideally where you can leave them for at least a few days, and go wild moving them around. This is your opportunity to try out new story directions with a low investment of time. Sure, looking at a bunch of cards doesn't guarantee you'll know how a change will work if you write it, but it's a place to start. → Don't play with index cards forever. Eventually you have to return to the manuscript and rewrite. But don't be afraid to take out the cards again partway through revision if you run into problems with your new plan. Here are photos of index cards for two of my novels. See how pretty? Click the photos for more information and larger views. Great stuff. I am going to share this information with students. They think organization is a waste of time. Thank you. Glad you found it useful, Denny! Awesome idea . 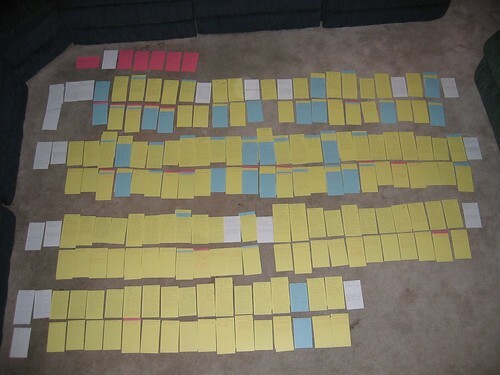 I've used the color coded index card method for plotting before I've written a word of my first draft, but I never considered it for revisions , until now . Thanks for sharing all of your photos. It really helped me because I'm a true visual learner. Glad this helped, Melissa! I find it so useful to have a visual representation of my story, at all different stages of the process. Lauren, cool that you went back to one of my old entries and tried this out!